The Confined Spaces Regulations were introduced in 1997 in response to the number of serious injuries and fatalities occurring, particularly in work areas where the volume of work undertaken was relatively little. Initially, no significant improvement in injury and fatality figures was noted following the introduction of the regulations. This was traced to the ‘I’ve done it this way for years’ culture of the industry, and the standard of training being provided. In this article I intend to address the questions: what exactly is a confined space, what are the training requirements to enter, and more importantly, how do you exit a confined space safely? Firstly, a confined space is not necessarily somewhere you have to squeeze into and then crawl about on your hands and knees while you are in there. I have come across a good example of this: a cargo ship transporting coal which had a spontaneous combustion in the hold. To remove the coal someone had to enter the hold and transport the coal to an area from which the grab mechanism could extract it. The hold was the size of a football pitch and the grab access was almost as large; however, the access for the man entering the space was a spiral staircase in a corner. The ship’s hold was ‘enclosed’, and there was a specified risk of carbon monoxide being produced by the spontaneously combusting coal. A specified risk can be: • Injury caused by fire or explosion • Loss of consciousness caused by an increase in body temperature • Loss of consciousness or asphyxiation caused by gas, fume, vapour or lack of oxygen • Drowning • Asphyxiation caused by a free flowing solid, or the inability to reach safety due to entrapment by a free flowing solid If you have an enclosed space with a specified risk you must meet the requirements of the Confined Spaces Regulations. It should be noted that the specified risk may not always be there; however, it may be introduced by the nature of the work, such as when cutting, welding or spray painting. The most obvious of flammable substances are easily recognised. When working in close proximity to methane pipelines or fuel storage tanks most people are aware of the obvious hazard, yet it should always be noted that this hazard might not be so apparent to the untrained individual. This is highlighted by the recent fatality caused by someone using an electric grinder to cut into an oil drum to make a barbecue. The fumes were ignited by the grinder, causing an explosion. I recently came across a risk assessment and control measures for entry into an area of a wood chip factory. The control measure being utilised was breathing apparatus; however, this would have given those making the entry no protection whatsoever in the event of an ignition and explosion of the flammable, airborne wood dust. The risk of oxygen enrichment should never be forgotten. This can arise from industrial processes or from leaking welding cylinders. An increase in the oxygen content in an enclosed area increases the flammability and risk of explosion. Generally, toxic gas is a well understood area and is fairly obvious in most circumstances; however, if you are welding, cutting or using solvents in an enclosed space, you will have introduced a specified risk as mentioned previously, and thereby created a confined space. What might not be so obvious is where someone is working inside a tank or vessel with no hazard, and someone outside is undertaking repair work involving cutting and welding - creating a hazard for those on the inside. Another example of this is in a brewery, where a vessel was stretched more than three floors of a building. In one instance I observed the welding work on the third floor had been properly risk assessed and controlled, and a rescue team had been deployed. This work had been completed and both workers and rescue team were cleaning up the area ready for departure. Meanwhile, on the first floor a solvent being used to clean the same vessel had been spilled and began affecting the individuals on the third floor - yet the risk assessment and controls ignored this connection. It was fortunate that a rescue team with breathing apparatus were still on site. Oxygen deficiency can occur for many reasons: • Purging to remove flammable or toxic fumes, vapours and aerosols • Naturally by biological process, such as in sewers, tanks, water drains and wells • Naturally by fermentation in the storage of crops, brewing and wood products • In a closed vessel, where rust consumes the oxygen • Carbon dioxide being produced by wet limestone chippings • Burning, cutting and welding • Freezing using liquid nitrogen • Breathing in poorly ventilated areas I had been taught, and have taught for many years, that you cannot see, hear, taste or smell an oxygen deficient atmosphere. In other words, you need a means of monitoring the atmosphere for oxygen content. This could be as simple as a flame safety lamp as used in coal mines, or an electronic device. Entering a confined space with no form of monitoring equipment is irresponsible, and has the makings of an untimely demise. Under no circumstances would anyone in this day and age ever attempt this, yet would you believe, I once encountered a worker foolish enough to think that he had a ‘natural ability’ for sensing an oxygen deficient environment? Defying all sense and logic, this worker in the brewing industry carried out bottom entries into vessels: already you can sense that he was not an advocate of best practise. Every time he entered a vessel - through this ill-advised and quite frankly potentially fatal method - he held his breath until he passed through the carbon dioxide. He had no means of monitoring when he was clear of this oxygen deficiency. Somewhat perturbed, I asked him if he had ever been overcome: his response was ‘Never’. I tried to explain to him that what he was doing was extremely risky and dangerous; should he be wrong one day, he and his family would suffer the consequences. His response was to challenge me to enter five vessels, me with my monitor and him with only his ‘natural ability’. Every time we entered a vessel, him foolishly with no respiratory protection and me wearing breathing apparatus and carrying a resuscitator for him, he would put his hand where the oxygen deficient atmosphere started. I would confirm it with my monitor. He was correct every time. How did he do it? He didn’t know. I still don’t know. He said the hairs on the back of his neck rose when he was nearing the oxygen deficient atmosphere. Thankfully, the days of relying on this so-called ‘natural ability’ are long gone. They should never have been relied on in the first place, and the method of entering the tank was wrong. The importance of isolating the ingress or presence of liquids properly cannot be emphasised enough. Solid materials which can flow include grain, sugar, flour, sand, coal dust, granules and powders. I was brought up in New Cumnock in Ayrshire. On September 7, 1950, 13 miners died when they mined upwards into peat and moss. This peat and moss trapped a further 115 miners and they had to be rescued from an adjacent mine. This became one of the most famous mine rescues of the time. The area where the men were trapped was contaminated by methane, creating both a flammable and explosive atmosphere at the fringes, and an oxygen deficient atmosphere elsewhere. This required the men to be rescued as a matter of extreme urgency. It was achieved three days after the inrush - just in time. Excessive heat can cause an increase in core body temperature which can lead to heat stress and eventually heat stroke. On many occasions I have seen examples of the poor selection of personal protective equipment (PPE) contributing to these conditions. These include control measures requiring the worker to operate in flame resistant overalls in situations, despite there being no risk of flame. In the meantime, the area the worker is in, such as a steam dryer, has a temperature of 40° C. Had the commencement of work been delayed, this would have reduced the temperature and the risk considerably. I was once asked to comment on rescue arrangements for work being undertaken on drying rollers in a paper mill. The risks were oxygen deficiency and heat. The entry was through a 15 inch diameter hole, and the supervisor proudly informed me that they had risk assessed the employees who could enter the confined space to carry out maintenance work. These were the smallest, lightest employees they had. I was then invited to meet the rescue team. Both men were big, heavy men who would have no problem handling the worker in the confined space. Could they enter the space to treat and remove him if necessary? No chance. Were the rescue arrangements suitable and sufficient? No. There are many other hazards which can affect safe working in confined spaces. These include electricity, mechanical equipment, noise, and dust. When work is required in a confined space, such as for maintenance or repairs, the following question should always be asked: is entering the confined space essential to carry out the work? Other methods should be looked at prior to committing workers into the confined space. These include: • Environmental monitoring, such as lowering a monitor, drawing a sample or using a pole • Using water jets, chemicals, steam or long handled tools for cleaning • Clearing blockages in silos by utilising flail devices, vibrators or air purges • Installing sight glass, portholes, grills or holes to allow visual inspection • Using CCTV rather than employees One producer of carbonated drinks has a problem in mixing vessels. They are confined spaces with a specified risk of carbon dioxide. They need to have the mixing blades changed due to wear and tear or in the event of a breakage, which is extremely expensive for the business, especially in down time. They have identified a replacement for the blades by injecting the vessels with compressed air to mix the content. The result is safer, requires less maintenance and vastly reduces the confined space entries. If you require employees to enter a confined space, you must prepare suitable and sufficient arrangements for their rescue. Very importantly, this is required even if the emergency is not brought about by a specified risk. I have witnessed a situation during a mock rescue exercise to prove that arrangements were suitable and sufficient, where a casualty with a simulated broken leg had to be removed from the stretcher, because it was impossible to manoeuvre the stretcher around a tight bend in the confined space. Imagine trying that with an unconscious casualty fitted to a resuscitation device. I have also seen, again fortunately during a training exercise, a casualty being lifted vertically who almost made it out of a reservoir wall when, due to a twist in the 20 metre vertical access tower, he had to be lowered to the foot of the tower and his boots removed as this was the only way to clear the twist and complete the rescue. I have been informed of a rescue carried out using a heavy duty tripod placed over a shaft, very successfully rescuing the casualty to the top of the shaft - until realising they had no way of ‘landing’ the stretcher and casualty onto the side of the shaft. It is hard to imagine being the casualty and being able to see safety, but not getting there. The important lesson is: practise to ensure suitability and sufficiency of your rescue procedures. Your rescue arrangements need to ensure you are protecting the rescuers, and where necessary should include resuscitation equipment. I have previously gone onto work sites where employees are provided with, and must wear, respiratory protective devices of either compressed air or chemical oxygen, only to find that there is no provision for resuscitation equipment. I am informed that if a worker needs resuscitation equipment they will call the emergency services; however, if someone is recovered from an oxygen deficient atmosphere you have three minutes maximum to get an oxygen supply to them. The chance of that happening by calling for help is minimal. When selecting people to provide emergency rescue, reference should be made to the risk assessment and required control measures. Consideration should be given to: • Causes of an emergency • Use of equipment, such as breathing apparatus, lifelines, tripods and winches, cutting and lifting equipment • Training in donning and using breathing apparatus • Testing and maintenance of rescue equipment • Identifying defects and dealing with them • Site rules and emergency communication • Isolation systems • Resuscitation procedure, including equipment • First aid • Fire fighting • Liaison with the emergency services • Rescue techniques, refresher training and mock exercises The most effective way of ensuring that work in a confined space is carried out safely and efficiently is to ensure everyone involved, from the manager to the supervisor to the operatives, is competent. As indicated previously, following the introduction of the Confined Spaces Regulations, the number of accidents, injuries and fatalities did not significantly decrease. This was traced to the quality of training being provided. To bring about an improvement in this situation, a working group was organised by one of the sector skills councils (SSC). This working group was made up of representatives of the Health and Safety Executive, the industry, training organisations and award organisations. The group established a National Occupational Standard for confined space training. 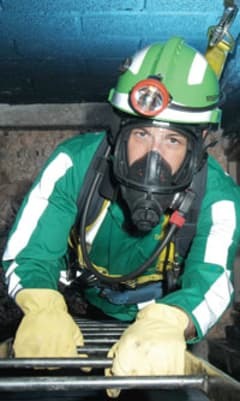 The award organisations then created qualifications covering: • Low, medium and high risk entries • Overseeing work in confined spaces • Emergency rescue and recovery of casualties • Managing confined spaces I would suggest you make use of the National Occupational Standard and the qualifications which are aimed at complying with it. During the process of developing the standard and the qualification, we found companies with 26 classifications for confined spaces and training assessed under a kitchen table and snooker table. I was also very recently informed about employees being assessed in a smoke filled portaloo, highlighting the fact that dangerously inadequate training is still out there. Before I reach my conclusion, I would like to give one more example of getting it wrong. A ‘blue chip’ company purchased chemical oxygen escape sets and chemical oxygen training models, yet they provided no training in their use. After several years of duty it was pointed out that the escape sets required testing periodically to ensure they were fit for purpose. When they were collected, it was found that the employees had been entering the live confined space with the training models. Fortunately they had not been required to use them as there was a definite specified risk present. Working in a confined space will always have an element of risk, but these risks can be controlled to make the risk acceptable. Considering the fatal implications of their misjudgement, I am constantly surprised by the absence of putting effective control measures in place for confined space safety. I have during my career suggested numerous sites are confined spaces, only to have this refuted until years later when, in many cases, those same work sites sought my help. There is an inexcusable lack of understanding when it comes to the risks and necessary controls when dealing with confined spaces that could be so easily addressed with adequate training. Our awareness of this deadly hazard must change - and fast - if we are to keep our workforce alive.